A U.S.-listed gaming company is set to open its second casino in Cambodia next month, the company said as it announced its revenues had grown to more than $20 million in 2012. 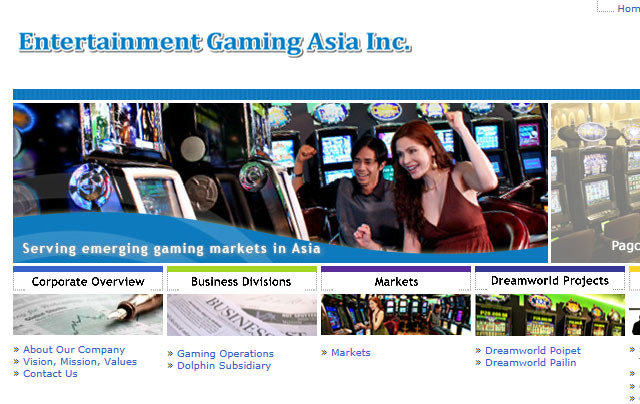 Entertainment Gaming Asia Inc. (EGA), which is backed by Macau-based Melco International Development Limited and is listed on New York’s NASDAQ stock market, announced its financial results for 2012 on Thursday. The company last year opened the Dreamworld Casino in Pailin province, and provides electronic gambling machines to Phnom Penh’s NagaWorld Casino and Thansur Bokor, the casino-hotel resort opened last year in Kampot province by the Sokimex Corporation. EGA also has a smaller operation in the Philippines. The company saw revenues of $20.4 million last year, a growth of more than a fifth from $17.4 in 2011. But EGA’s earnings fell from $11.7 million in 2011 to $10.9 million last year, the company said in an announcement posted on its website. According to the announcement, the company’s second Cam­bodian casino, in the border town of Poipet in Banteay Mean­chey province, is currently under construction, but is expected to be open for business in April. “This $7.5 million project, which is being constructed as a stand-alone extension to an existing casino owned by a local Cambodian company, is scheduled to soft open on March 28, 2013, with approximately 300 premium [electronic gaming machine] seats,” it said of the Dreamworld Poipet project. EGA’s Dreamworld Pailin casino opened its doors in May, and contributed $1.8 million to the company’s revenue in the year. Most of that revenue, $1.3 million, came in the last three months of the year, as EGA upped its marketing efforts for the casino to draw in more gamblers, the announcement said. “However, volatility remains as the company continues to refine its marketing programs,” the announcement said. EGA’s new Dreamworld Casino will join many others on Cambodia’s borders, which exploit the fact that while regional countries, including Cambodia, ban their own nationals from gambling, people from both Thailand and Vietnam cross into Cambodia to gamble. NagaWorld, which holds an exclusive license to operate in Phnom Penh, announced profits of $113.1 million for 2012, and its Malaysian founder, Chen Lip Keong, was recently listed as a dollar billionaire by Forbes magazine.